With its awe-inspiring height and incredible detail, the Salt Lake LDS Temple has to be the most amazing LDS temple to photograph. For me, black, white and sepia tones capture its timelessness best. 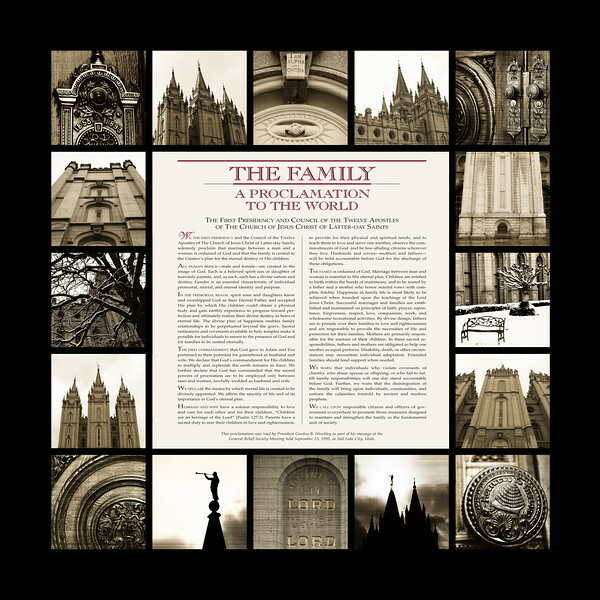 With a simultaneously modern and antique feel, these photographs are a perfect representation of a place that Mormons revere for binding Eternal Marriages that allow Familes to be Together Forever. A little history: Four days after entering the Salt Lake Valley on 24 July 1847, Brigham Young designated where the temple would be built, and on 6 April 1853, he laid the cornerstone of the temple foundation. That event marked the beginning of a long construction process. Many difficulties slowed the building of the temple. Granite was quarried in Little Cottonwood Canyon, 20 miles southeast of Temple Square, and transported to the site by teams of oxen. A single wagonload required four days of travel to reach the temple site. Work on the temple stretched from years to decades until finally, 40 years after it was begun, the temple was completed and dedicated on 6 April 1893 by Wilford Woodruff, the fourth President of the Church. Today, Latter-day Saints continue to gather in temples throughout the world to worship and participate in sacred ordinances such as eternal marriage.